Бесплатный утилита, которая поможет вам в создании gif-анимации изображения рабочего стола (или ограниченной области) при нажатии «горячей клавиши». EXIF-составляющую (необходимо редакторам и фотографам). Ещё ScreenToGif может выполнять запись «Green Screen» для быстрого «забивания» ОЗУ (необходимо для удаления «непубличной» информации и паролей из временного файлового хранилища). Все эти функции выполняются апплетом, размером чуть более 1 мегабайта. Программа является мощным GIF-комбайном. В настройках можно указать автоматическую отправку снятых анимационных роликов на удаленный сервер (полезно при удаленном администрировании). Экспортировать выходную анимацию также можно в более 25 разных граф. форматов (поддерживаются бытовые медиа-проигрыватели). ScreenToGif - Screen, webcam and sketchboard recorder with an integrated editor. This free tool was designed to work as a quick and small screen recorder. This tool allows you to record a selected area of your screen, live feed from your webcam or live drawings from a sketchboard. Afterwards, you can edit and save the animation as a gif or video﻿. ♦ Fixed: Memory leak while recording. ♦ Fixed: Delay value for imported gifs. ♦ Fixed: New lines for the dialogs. ♦ Fixed: When closing the Editor, the Encoder should close too, if there's nothing being encoded. ♠ Multi-DPI set of monitors are not supported. The recording will result in a wrong portion of your screen if recorded within the second monitor to the right. ♠ The action stack (that enables the Ctrl-Z and Ctrl-Y) may "eat" a lot more of your disk space than it should. To avoid this, don't forget to clear the temp. folder (Options > Temp. Files > Clear). ♠ The board recorder is in a beta state, work in progress. ♣ Recording delay with frames with no changes. ♦ While discarding the recording, the app would let you start a new recording before finishing erasing the files of the previous one. ♦ Encoding with Gifski (Note: It's now using a DLL instead of the executable). ♦ While adding overlays (Free Text, Free Drawing, Border...) with an image with a DPI not equal to the current DPI of the screen, the overlay content would not appear on the right position of the frame. ♦ The recorder window position was not being restored properly if the window was closed while it was on a secondary monitor. ♦ Encoder: Right-clicking to copy a video file was crashing the app. • APNG support (for saving). • Added the option of copying the output file/filename/folder after the encoding. • Added the option of running post encoding commands. • Added the Obfuscate feature. It's used to pixelate a region of the image. • You can now use FFmpeg or Gifski to save your gif. • Added the Spanish (Spain) translations. • Updated the Russian and Chinese (Simplified) translations. • You can now download FFmpeg and Gifski directly using the app. Head over to Options > Extras to download it. • It's now possible to press the enter key to load the selected project from the table of recent projects. ♦ Images with high dpi (for example, 600dpi) were not displayed correctly. ♦ Clicking on 'Recent Projects' if the temporary folder does not exist would give an error. ♦ After changing the delay of frames, the Statistics tab was not updating. ♦ When opening a project (or any other file) via drag and drop on top of the executable (or link) or via the "Open with..." context menu, the app was opening the startup window instead of the editor. ♦ While using the new recorder, if the record button was pressed without a screen region selected, an error was happening. Now it will enter the selection mode. ♦ While clicking on the link to open the file that already exists for types other than Gif, it was only opening the gif file. • The app and the installer are now digitally signed! You should see my name (Nicke Manarin) on the properties of the files. • Redesigned screen/window/area selection experience on the new recorder. • The app will ask before closing if there's anything being edited. 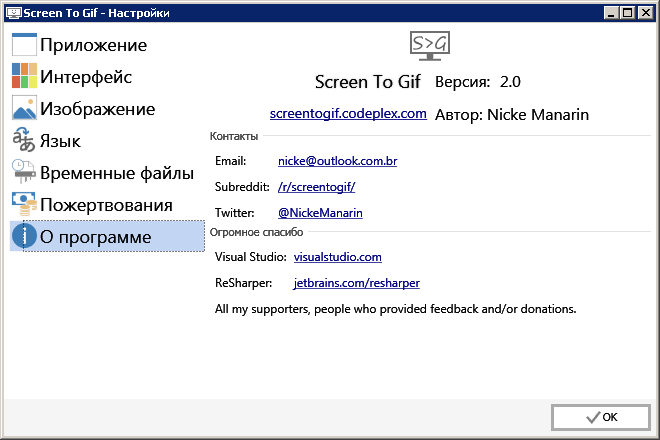 • Added the option to save the project while saving a gif (by using the same filename). ♦ For some users, clicking to stop the recording was crashing the recorder. ♦ The "Insert recording" action was ignoring the option of using the new recorder UI. ♦ Added support for images with ".jpeg" extension (same as .jpg that is supported already). ♦ The app now remembers the last used position of the Watermark. ♦ Pressing Esc wasn't closing the panel when the keyboard focus was inside the Free Drawing and Cinemagraph elements.